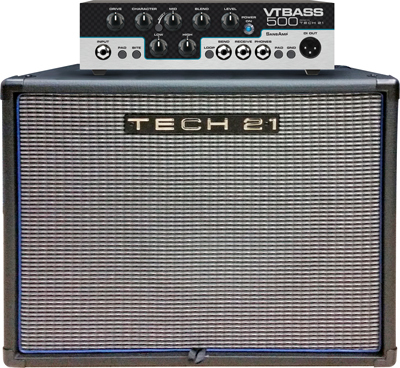 VT Bass 500, Bass Guitar Amp Head from Tech 21. 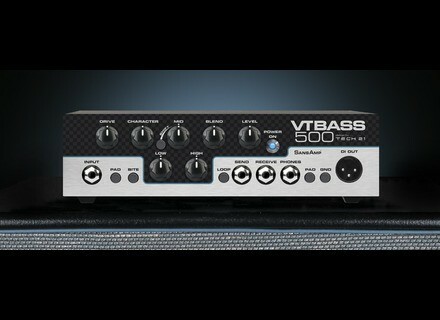 The VT Bass 500 is a 500-Watt bass amp head, with an all-analog SansAmp pre-amp and Class D power amp. It is formulated with the same proprietary technology as the SansAmp Character Series VT Bass DI pedal. The Character control is said to sweep through decades of some of the most distinctive bass amp tones on the planet, while Drive adjusts the overall amount of gain and overdrive, similar to when the output of a tube amp is being pushed. A Blend control allows to blend the direct instrument signal with the SansAmp Tube Amplifier Emulation circuitry. The Bite switch activates a presence boost, which tightens up the sound when you are in distorted settings. It also adds definition to your notes when playing in cleaner settings. An optional speaker cabinet (Model B112-VT) is also available. Optional rackmount kit and gigbag available. For more details, visit tech21nyc.com.